I really hope none of you have heart conditions. Because if you do, the adrenaline-inducing Madam Secretary Season 4 Episode 22 may not be medically advised for your viewing pleasure. On the other hand, it can't be more stressful that reality. In a world where America has, at best, engaged in a mad-man strategy with another nuclear power or, at worst, has given the nuclear codes to a senile, paranoid isolationist, discussing the merits of nuclear readiness is probably a good idea. I'm really curious to hear what other viewers thought about time jumping back and forth as we saw different pieces of the story from different viewpoints. I'm usually up for shaking things up and trying innovative approaches to storytelling, but I thought this attempt fell flat. It wasn't that it was a bad idea, per se, but it was awkwardly executed. The jumps back weren't consistent, and some of the skipping around seemed unnecessary. It's always better to avoid the possibility of confusing your audience. The story worked, it just needed to be cut together a little differently. And maybe some time codes instead of just "12 Hours Previously" captions. But those are small details, details that are more important when looking at "Night Watch" as a stand-alone entity. But it isn't one. 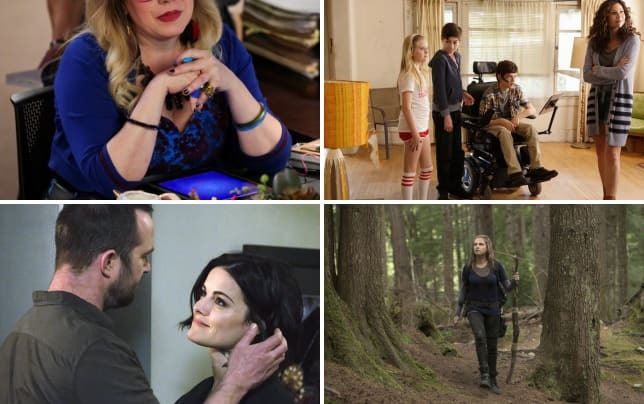 The finale was excellent by the most important standard for a finale: arcs were wrapped up and yet we were left looking forward to what's next. The only major storyline I feel like is still up in the air is what's going on with Daisy and Matt. Clearly, she's figured out that Waffles the Beagle is an excellent wingman, but it also doesn't seem like it's going anywhere with the men she meets. And yeah, okay, Matt committed to Captain Ronnie ... but knowing the world almost ended didn't drive him to her side. Or even make him bring up her name. I'm not saying I'm on the list. But let me just tell you what that particular privilege buys you. You get whisked away...without saying good-bye to your friends and family. And then, you get to be in an underground bunker with generals and top government brass for weeks or months eating MREs and drinking ionized water. You emerge after the radiation reduced to livable levels, at which point you get to try to pick out your loved one's bones from the rubble and ash. And then, you spend however many years running the bombed out husk of the former United States government under martial law. That's not a list you want to be on. I do regret that the staff, save Jay, was left out of the loop. Sebastian Arcelus did an excellent job with the monologue at the bar, but I would have enjoyed more of the staff having emotional reactions because of the narrowly averted disaster. Even the jump a month forward didn't give us the impression that anything had changed for any of them. Which, yeah, was sort of the point, things were back to normal. But don't you think you'd have made some kind of alteration to your life? Was Bess really the only one to have an epiphany? Elizabeth announcing her intention to run to Henry was probably the least surprising finale reveal of the year. 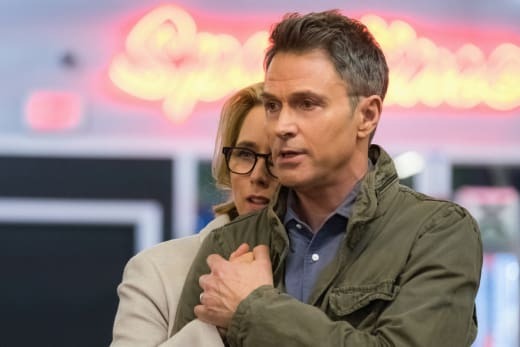 As I pointed out in the Madam Secretary Season 4 Episode 17 review, it's the only plausible way to keep the show going long-term. I'm just surprised that this is what tipped her over the edge. I mean, after gaining such widespread support for her policy, I'm not why she's afraid that it would be rolled back. That was the whole point of declassifying, right? Activate the populace and ensure that lawmakers had to take action or risk losing seats? Why would that suddenly change? I loved that Henry was right there with the audience, completely the opposite of shocked in response to her declaration. But his reaction wasn't the one I was most hoping to see. That honor goes to Russell. You just know he's going to lose it and immediately go into planning mode. Ramping up for a campaign should make for some interesting changes for the upcoming season. I'd be very surprised if we don't see more of Mike B. He seems like he'd be essential for her campaign, if only because of his knowledge of DC gossip. Elizabeth: This whole ordeal has reminded me of the importance of civic duty. It's reaffirmed my faith in the process, you know? Elizabeth: We got this enormous thing done, Henry, and I feel a responsibility to make sure it doesn't get undone. When the time comes...I want to run for president. Permalink: I want to run for president. But what will become of the rest of the staff at State? They can't possibly all follow her on the campaign trail or to the White House. It's also a safe bet that there will be some continuing friction between Elizabeth and her NSC counterparts after her intention to run becomes common knowledge. Things might smooth over with Ellen, but I could see a challenge coming from Gordon. And then there's Morejon to consider. It's not likely that he'll just slip quietly into the background -- not unless Jose Zuniga lands a better gig. So what was your take on "Night Watch?" Do you think standing down on ICBM readiness is a good idea or sheer stupidity? Did you like the backseat role the kids played? 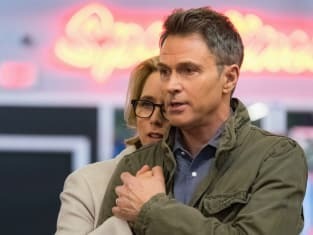 What are your predictions for Madam Secretary Season 5? Need to take a break from reality with a dose of Elizabeth and her team during the hiatus? You can watch Madam Secretary online with us anytime, anywhere! So the world was saved by a philandering general. Maybe his mistress should get a medal. Permalink: So the world was saved by a philandering general. Maybe his mistress should get a medal. Stevie: Why won't Russell answer my text? Jason: Um, other than helping run the most powerful country in the world? Permalink: Um, other than helping run the most powerful country in the world?